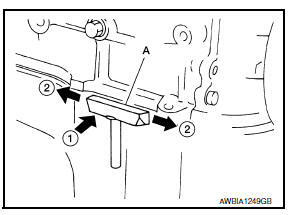 After removing the bolts and nuts, separate the mating surface and remove the liquid gasket using Tool (A). In areas where the cutter is difficult to use, use a plastic hammer to lightly tap (1) the cutter where the liquid gasket is applied. 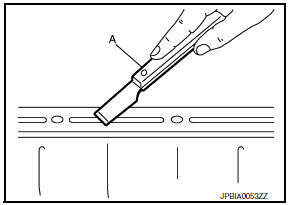 Use a plastic hammer to slide (2) the cutter by tapping on the side. Do not damage the mating surfaces. Using suitable tool (A), remove old liquid gasket adhering to the liquid gasket application surface and the mating surface. Remove liquid gasket completely from the groove of the liquid gasket application surface, mounting bolts, and bolt holes. Wipe the liquid gasket application surface and the mating surface with white gasoline (lighting and heating use) to remove adhering moisture, grease and foreign materials. Attach liquid gasket tube to the suitable tool. Use Genuine Silicone RTV Sealant, or equivalent. Refer to GI-21, "Recommended Chemical Products and Sealants". Apply liquid gasket without gaps to the specified location according to the specified dimensions. If there is a groove for liquid gasket application, apply liquid gasket to the groove. As for bolt holes (B), normally apply liquid gasket inside the holes. Occasionally, it should be applied outside the holes. Within five minutes of liquid gasket application, install the mating component. If liquid gasket protrudes, wipe it off immediately. Do not retighten mounting bolts or nuts after the installation. After 30 minutes or more have passed from the installation, fill engine oil and engine coolant. If there are specific instructions in the procedures contained in this manual concerning liquid gasket application, observe them.